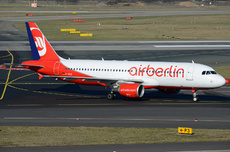 Air Berlin flight AB8070 from Berlin-Tegel Airport, Germany, landed on runway 04L at Helsinki-Vantaa Airport, Finland, at 01:00 hours local time. The pilots taxied to the stand of gate 29 at terminal T2. Soon after arriving at the gate people smelled the odour of an electric fire burning and smoke became visible at the front of the cabin. Cabin attendant A (senior cabin crew member) ordered cabin attendant B (cabin crew member) to don protective breathing equipment (PBE) and gave her a portable Halon fire extinguisher. Cabin attendant B donned the smoke hood and activated its oxygen generator. Cabin attendant A reported the smoke on the interphone to the flight deck as well as to attendants C and D at the rear of the cabin. The training captain, seated in the co-pilot’s seat, went into the cabin to check the situation and soon returned to the cockpit to report the smoke to the captain and the air traffic control. He also told the ramp crew that they were not to open the cargo doors because the source of the smoke was unknown. The pilots began ascertaining if the smoke originated in the aircraft’s systems. Just to be sure they shut off the APU bleed air, as they had turned it on just prior to the smoke being detected. The passenger services agent knocked on the aircraft door to indicate to the crew that they could now open the front left door. She placed a detached platform (walk ramp) between the jetway and the aircraft. When cabin attendant A opened the door she said that there was a fire on board and that the passengers should be evacuated immediately. Prior to this the passenger services agent had not been informed of the fire. Cabin attendant A made an announcement in English, ordering the passengers to return to their seats. The passengers at the front of the aircraft obeyed the order and cabin attendant B could proceed forward down the aisle. Cabin attendants C and D could not see the situation because passengers were standing in front of them. Cabin attendant C discussed the situation with cabin attendant A on the interphone, inquiring about the need to don smoke hoods at the rear of the cabin. Cabin attendant A replied that this was no longer necessary. The passengers were shouting that the smoke was coming from the right side of the aisle, pointing to the footwell of seat 8F. Cabin attendant B noticed that the smoke was coming from a nylon backpack containing a laptop computer. She moved the laptop with her foot so as to make it more accessible and then discharged the fire extinguisher towards it. In addition, she shoved the neighbouring passengers’ bags and overcoats to the side and kept monitoring that the fire had been extinguished. She also told nearby passengers to cover their mouths and noses with cloth. The sequence from the first detection of smoke to extinguishing the laptop took approximately one minute. The situation caused restlessness among the passengers in the rear of the cabin at which time cabin attendant C began calming them down. Since there was still acrid smoke in the cabin after the fire had been extinguished, cabin attendant A called cabin attendant D on the interphone and told her to open the left rear door. Cabin attendant D opened the door and placed a barricade strap in front of it because there were no passenger stairs at the door. Cabin attendant A announced that the passengers should disembark rapidly. Soon after this she made another announcement, telling all passengers to leave their belongings in the cabin. between the jetway and the aircraft had to be removed as it was too slippery. All passengers deplaned through the front left door. Some of the passengers followed the instructions and disembarked without their outer garments or hand luggage. They stayed at the boarding gate to wait for their belongings. Other passengers tried to take their hand luggage with them, which resulted in the aisle being blocked and the deplaning process being slowed down. A wheelchair-bound passenger was the last one to be assisted out of the aircraft. The brand or type of laptop was not mentioned in the AIB final report. However, the battery specifications, laptop dimensions described in the report, along with photos of the laptop show strong similarities with an Acer Aspire Switch E model. It had a double-cell 3.5 volt (V) lithium-ion polymer (LiPo) battery with a 30 Wh rating. The stated capacity of the battery was 8060 mAh. The family that owned the laptop had bought two laptops approximately six months before the occurrence. Both laptops had their original CE-marked batteries. According to the owner the laptop did not heat up unusually during use. The damaged laptop was switched off for the duration of the flight. According to the experts the laptop fire was possibly caused by external damage to the battery. While a hole was detected on the outer surface of the battery, the investigation could not confirm whether the hole had been there prior to the fire or caused as a result of it. 1. The lithium-ion battery of a laptop placed under a seat caught fire as an Airbus A320 airliner, after having landed at Helsinki-Vantaa airport, was taxiing towards its arrival gate. Conclusion: Devices fitted with lithium-ion batteries are routinely transported in aircraft. Laptop battery fires are rare in flight but they are not altogether unheard of. Lithium-ion batteries are categorised as dangerous goods. In light of the investigation material, operators’ instructions for transporting lithium-ion batteries by air vary in content, availability and clarity. 2. The ways and means to control fires in the air are limited. Even a small fire in a closed space is one of the most serious threats to aircraft. For this reason a fire must be met with immediate and decisive action. Conclusion: Ways of controlling fires in the air constitute, among other things, first extinguishing equipment and systems on the aircraft, firefighting training provided to the aircrew as well as the proper placement of luggage. 3. The crew acted in accordance with their training and the operator’s instructions during the fire. First extinguishing was successfully completed and the fire did not spread in the cabin. Following this, the communication between the crew and the fire officer who entered the cabin did not function adequately in all aspects. Therefore, they did not share the same situational awareness at the onset of the events. Conclusion: The aircrew were well prepared to control a fire in the cabin. The extinguishers that were used worked well and they were appropriate for the task. Following the successful first extinguishing the aircrew considered the situation to be over. 4. After the first extinguishing the crew ordered the passengers to immediately leave the aircraft. The passengers were not gathered together in the terminal following disembarkation. By gathering passengers together it is possible to find out whether all persons on board the aircraft have deplaned, to check their condition, and provide additional information to them about the incident. Conclusion: The instructions of the airline’s representative and those of HelsinkiVantaa airport contained no guidelines for rapid passenger disembarkation in an abnormal situation or for managing the situation inside the terminal after the occurrence. 5. The training captain reported smoke in the cabin to the air traffic controller and requested rescue units be dispatched to the aircraft. At the same time the captain requested a frequency for communicating with the rescue units. Conclusion: The training captain’s request was clear. The air traffic controller acted in accordance with the request for help, alerted airport rescue and relayed the distress call to the Emergency Response Centre. Helsinki-Vantaa had not designated a frequency for communication between rescue units and aircraft. 6. At some point in the phone call the air traffic controller assessed that the air ambulance was not needed at the site. The events in the cabin progressed rapidly; neither the aircrew nor the air traffic controller had enough time to form a sufficiently accurate opinion of the possible harm to the passengers caused by the toxic fumes or the extinguishing agent. Conclusion: The assessment of the need for an air ambulance at the target must be based on timely and authenticated information received from the site. The rescue authority, as the overall situation commander, is in charge of the rescue operation; only the commander has the right to relieve units as required by the situation. 7. The fire officer who rode on the foam tender received preliminary information of the fire after the training captain opened the cockpit window. Following this, he went into the cabin to check what was happening and to get a picture of the situation. Conclusion: The incident commander received good situational information from the fire officer that entered the aircraft. He was then able to establish a situation picture and also relay this information to the rescue units of Central Uusimaa Rescue Department. 8. Lithium-ion batteries are commonly used in portable electronic devices because they are light and long-lasting and have a larger capacity per weight ratio than other battery types. Lithium-ion batteries are becoming increasingly commonplace. Conclusion: The production of lithium-ion batteries requires sophisticated manufacturing technology. An internally or externally damaged lithium-ion battery may ignite in an explosive manner, causing material damage and injuries to persons.